While some camcorders include automatic image adjustment, for example, Panasonic HDC-TM700/HS700/SD700 is equipped with 3MOS system and Intelligent Auto (iA) function to shoot perfect videos. However, if you get videos with low light, or occasionally move to outdoors with excessive brightness that produces blown highlights, you may need video restoration to change the video brightness, contrast or saturation. Aunsoft Final Mate is the recommended HD camcorder video editor with video restoration. 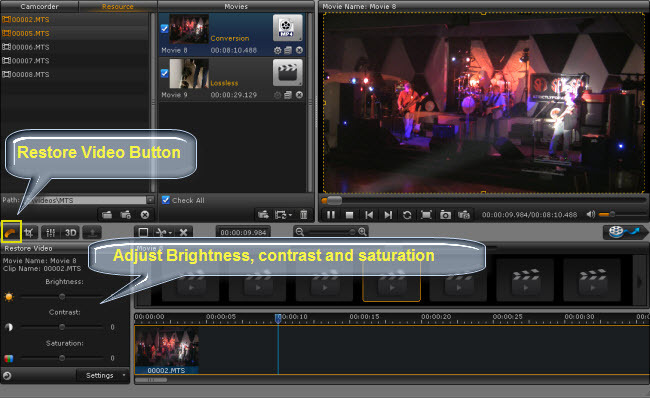 You can adjust the brightness, contrast and saturation with the video editor. For long time recording with different light conditions, you can also cut the video clip to restore video accordingly. Below is the quick step-by-step guide about adjusting video brightness, contrast and saturation with Aunsoft Final Mate for perfect movie creation. Step 1. Import video files to Aunsoft Final Mate. You can directly capture videos from camcorder connected to computer, or import .mts, .m2ts, .tod, .mod files from computer folder. To import videos from computer, just choose Resource Tab and select a path to display the saved videos. To capture videos from camcorder, just click the "Camcorder" button or follow the wizard to import camcorder videos. Step 2: Create one or more movies for editing on Timeline. Then you can easily drag and drop the video files listed in resource library to Movies Tab to create single or more movies. Then double click to highlight the movie in timeline and play it in inserted player. Step 3. Restore video with brightness, contrast and saturation. Click on one video clip on timeline, then enter "Restore Video" window to adjust brightness, contrast, and saturation. Drag the slide bar to the left or right, you can view the Restore Video effect on the preview window in real time. Step 4. Select output format. Click on the format name showing as below to choose the output format according to your end usage. The output formats could be .wmv, .mp4, .mov, .3gp, .mpg, etc. Since video restoration requires re-encoding, so only movies for conversion will works. However, Aunsoft Final Mate, as the easy-to-use camcorder editing software, provides fast conversion speed, and will use NVIDIA video card with CUDA technology, or Intel CPU for acceleration if applicable. In the Final Mate main interface, there is checkbox for deinterlacing. You can deinterlace 1080i camcorder videos for playback on PC or portable devices.